A bargain hunter with a competitive streak, my friend Sarah refuses to let her mortgage get the better of her. BM (Before Mortgage), she used to dine out at Comme and shop on Collins Street, but AM (After Mortgage), she’s traded dining out for dining in and makes do without furniture. Despite her conversion to Thriftianity, there is one habit that she won’t renounce: supermarket shopping. Sarah’s a busy woman. She doesn’t have time to go to the greengrocer, the butcher, and the baker. With an open-at-all-hours supermarket down the road, she’s willing to pay that bit extra for the convenience. Convenience is worth only so much, however. When I took Sarah to Box Hill Market, the bargain hunter within her took over. 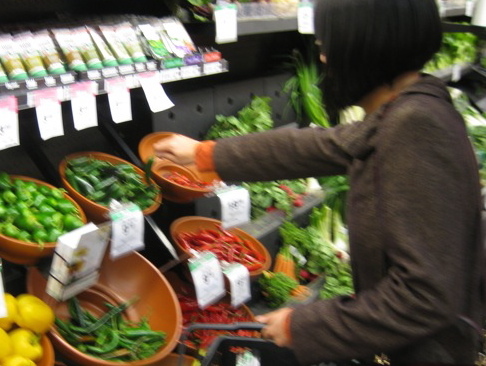 ‘That’s so cheap,’ she declared, pointing at a produce box in front of Yang Yang Groceries. ‘I knew it’d be cheap, but not that cheap!’ It wasn’t the end of the day; there was nothing wrong with the fruit nestled inside; it was simply half the price she’d pay at the supermarket. Nowadays, Sarah buys up big at Box Hill once a week, relying on the supermarket only for top ups. By doing this, she reduces her food bill without being inconvenienced. There are markets and there are Markets. With their competitive prices, markets attract pensioners, immigrants, and other thrifty types. On the other hand, Markets are the exclusive domain of yuppies; they’re great for sourcing that hard-to-find item but they’ll charge an arm and a leg for it. Go early in the day and you’ll won’t have to sort through a box of bruised mangoes. Alternatively, check with the stallholder when new stock arrives, and shop accordingly. In-season produce will always be cheaper, fresher, and tastier than their counterparts. 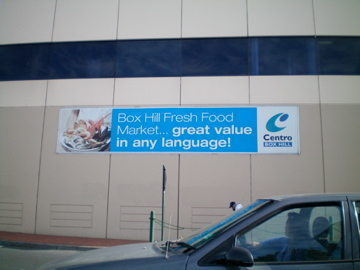 Check out websites such as marketfresh.com.au to get a feel for what’s available. ‘Three bunches of bok choi is cheaper than buying one,’ Sarah advises. ‘Make a theme of it for the week and plan meals around these specials.’ Make sure that your bulk buy is the better deal, and that none of the food will go to waste. Just because it comes from a market doesn’t mean that it’s cheaper. Supermarkets do sometimes match or beat markets with their specials. If you’re usually squeamish, stay clear of the meat and seafood section. Unlike the staff at Coles and Woolworths, market fishmongers and butchers don’t try to hide the fact that their cuts come from fish or animals. If you’re less fussy about the quality of your fruit and veg, shop just before the market closes. There will be bargains.